Guess what, ghouls and goblins? Halloween is just seven days away and we're celebrating with a week jam packed with All Hallows' Eve goodness! OK, sure. We've actually been celebrating Halloween for almost two months now on Stellar Four but can you blame us? Halloween's one of our favorite holidays and this year we're making it extra special with an awesome contest. 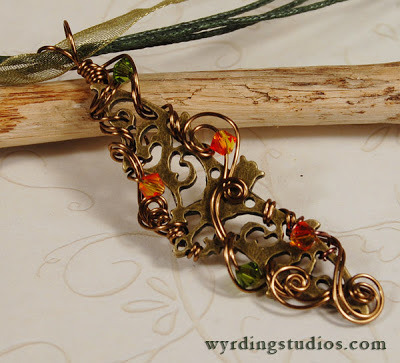 S4 and Wyrding Studios are giving away this BOO-tiful* filligree brass bat necklace. And, to sweeten the pot, the giveaway is open to S4 followers all around the globe! To top it all off, everyone gets a 20% off code for orders of $30 or more at Wyrding Studios. Get a jump start on your holiday shopping through the end of November by entering the code STELLAR when prompted. You can check out their available designs here. All you need to do to enter the giveaway is send us an email titled Halloween Contest and let us know which social media you use to follow us with a link to your account! *Sorry. Sometimes Megan S. just can't help herself when it comes to puns.